Today’s face is a magician’s assistant. At least that’s what I was told. This picture was taken in Beverly five years ago. At the time I was with Weber Shandwick and we were doing some work with GM. The program was intended to introduce people to GM cars in unexpected venues. We had a fleet of cars – a little Saturn convertible, a hybrid Suburban, a really fun Cadillac, a Buick – I can’t remember them all now and would take them to different events in eastern Massachusetts. We went to the Bolton Fair, Newbury Street, the big milk bottle by the Children’s Museum, a BC football game, all over. It was a lot of fun and people seemed to enjoy checking out the cars. One of the events was a Lobster Festival in Beverly. It was a raw and rainy day. We had two cars with us – a Saturn and a Suburban – and set them up as best we could at the edge of a muddy field. I don’t recall if the magician was with us or just happened to be nearby. In either case, he was a friendly fellow whose act (at least what I remember of it) was mostly making balloon animals. This woman was with him and was doing face painting. Because the weather was lousy and the crowds thin, we all ended up talking – the Weber team and the magician and his assistant. It turned out that she was either a relative or a friend of a relative and had come from Russia. Her role and her relationship with the magician was kind of unclear. 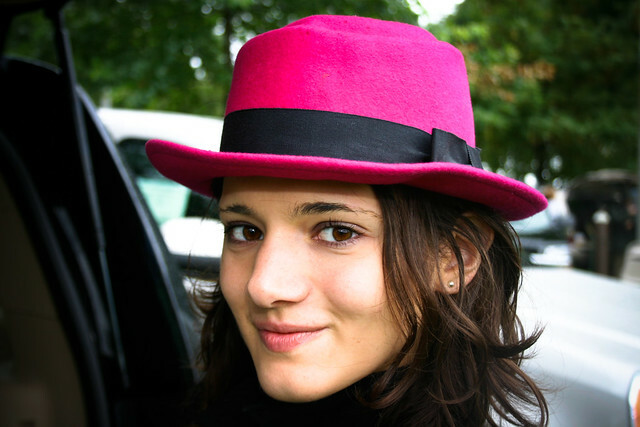 She was friendly though, and pretty, and her pink hat was a bit of bright color on a drab midsummer day.